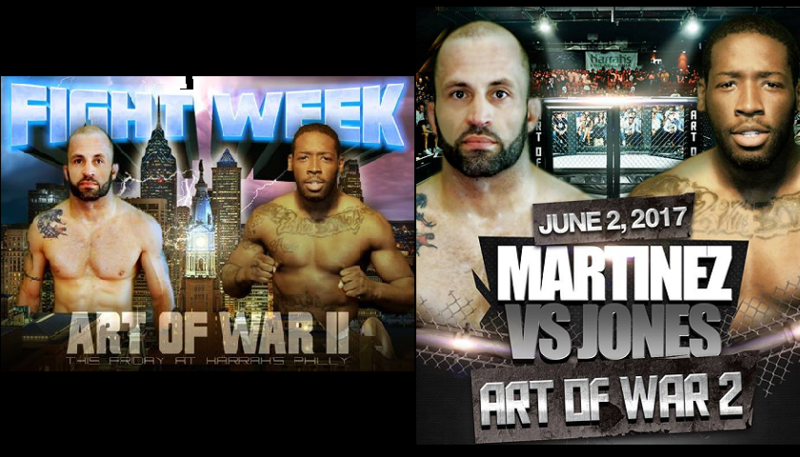 Art of War 2 goes down tonight at Harrah’s Philadelphia Casino in Chester, Pennsylvania and is headlined by a grudge match between Will Martinez and Sharif Jones. The highly anticipated fight between two of Philadelphia’s own, almost didn’t happen. Yesterday, there was a scare at the weigh-ins as it took Jones four attempts to make a catchweight of 152 pounds. What an entrance Jones made here in Philly tonight. Several rappers performed on the way to cage, taunting the Martinez audience, fights broke out in the audience. It took more than 15 minutes for security and officials to get the fight underway. The show was on the verge of being shut down. Surprisingly the two fighters touched gloves before the contest started and from there they went to battle. Martinez clipped Jones early. A rear-naked choke almost ended the fight as Martinez was strangling Jones with all of his might, but Jones fought through. The crowd is chanting for Martinez. Jones works a takedown, and when the fight returns to the feet Jones is working a standing guillotine. The third round saw each fighter finding their individual successes and when the final bell rang, the two embraced. Martinez was awarded a split decision win and the ballroom had to cleared before the fighters could leave the cage. Apparently something happened to Jones’ mother and Jones charged the cage and guard would not let him out. Officials had to plead to let the fighter out who then bolted out the door as obscenities were shouted his way. Elijah Harris and Timothy Tyler made up the evening’s co-main event. Both fighters are making their pro debuts, in what is a rematch from their December fight in which Harris was declared the victor after an injury stopped Tyler from continuing. This fight was an absolute war. Harris opened up a gash over the eye of Tyler, leaking blood all over both fighters. Every time you thought Tyler was out of it, he bounced back and threatened Harris. The crowd is standing on their feet for this back and forth brawl. Harris lands full mount sending down vicious ground and pound in the second, only to be reversed and find himself in the exact same position. The fight continued through the third before Harris finished the fight with a submission. After the fight Tyler congratulated Harris but then called out the Dill brothers in a profanity laden tirade and all hell broke loose in the audience. It seems a grudge match is in the making. Mike Melso and Luis Angueiracame out to BANG!!! These two exchanged leather from the toll of the bell; 43 seconds later, Angueria folded like an accordion, knocked out and leaking blood from his lip. One of the best knockouts you will see in an amateur fight. To build on that short fight, Joe Pyfer of Balance MMA tried to make even shorter work of Rashaun Day. Pyfer took the fight to the mat, sunk in a rear-naked choke with the hooks in and that was a wrap. This contest took 1-second longer than the first contest, ending at 44 seconds. Third fight starts…… 52 seconds later, Derrick Bradley defeated Frankie Coleman via guillotine choke. Bradley is coming back after a bout with Cancer. Ed Doud vs. Brandon Davis was the first fight of the night to go past the 52-second mark. Referee ‘Big’ Dan Miragliotta had oversight on the contest. In the brief exchanges on the feet, each fighter seemed to find success at one point or another but several times throughout the fight, Davis took Doud down, and then seemed to maintain dominance and control which led to him winning a unanimous decision. Cameron Chism vs. Kaheem Murray was a fun fight. Murray is lightning fast with his strikes and movement. While not all the shots landed, the ones that did, stunned Chism, who also returned the favor. 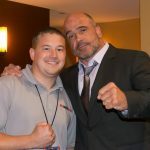 The first round was fantastic but the second round started with a Chuck Liddell vs. Wanderlei Silva type back and forth slugfest that favored Murray before Miragliotta jumped in to end the contest just 14 seconds into the round. Murray is the organization’s first 170-pound champion. Andre Petroski immediately took Jon Tuxford to the canvas, took his back, sunk in a choke and is taking home the Art of War middleweight strap.